It’s no secret video games have long aspired to emulate the grand drama and theatre of cinema, but few developers have attempted to blur that line with quite as much conviction as Quantic Dream. Led by controversial studio head David Cage - a man who divides players and critics as much as the quality of his games does - its output certainly isn’t afraid to veer more into ‘interactive film’ territory than that of a traditional ‘game’. That same ethos runs through the heart of its latest PlayStation 4 exclusive, and while it retains many of the issues that have dogged Cage’s titles for almost two decades, Detroit: Become Human is the studio's most accomplished project to date. It’s both brilliant and flawed, a technical masterpiece on a near five-year-old console where morality, duty and loyalty are all tested in equal measure. Even running on a vanilla PS4, this is one of the best-looking games on Sony’s hardware we’ve seen thus far. Set in the titular Motor City in 2038, society has been transformed by the advent of technology. The creation of artificial intelligence capable of passing the Turing Test (whereby a machine is able to exhibit human-like intellect and behaviour) sees androids enter every avenue of life. They care for our children, clean our streets and even travel the stars on our most dangerous space voyages. They’re machines designed to serve civilisation, but it’s a civilisation that’s slowly realising these ‘plastics’ are more efficient than they ever could be. With the environment now irrevocably damaged by an increasing population with a far longer lifespan, and Russia and America on the brink of conflict over resources in the Arctic, we enter a world seemingly on a tipping point. As the story begins, you’ll guide the journey of three very different androids - Markus, a carer who is treated less like a slave and more like a person; Kara, a housekeeper re-entering a broken and abusive home; and Connor, an advanced model designed to investigate the rising numbers of androids rejecting their programming in favour of independent ‘deviancy’ - as they each attempt to forge their own destiny. If you’ve played the likes of Heavy Rain or Beyond: Two Souls before, you’ll be familiar with the gameplay tenets Quantic Dream has stuck to with Detroit. There are elements from myriad genres at play here - you’ll investigate crime scenes in search of clues, trade bullets in gunfights and solve environmental puzzles aplenty - and they’re all presented in a manner that’s both limiting and empowering. It’s a game that often forgets it's a game, for better and for worse. You’ll move each character on-screen with the left analog stick, much like a traditional third-person adventure, but there’s an almost stifling reliance on QTEs (quick-time events). Everything from clearing away dishes and preparing food, to searching for clues and platforming are all based on using a variety of analog stick movement and button combinations. After a while, you realise you’re less of a player and more of a director as you guide each character through scenarios with multiple branching paths and divergent storylines. It’s not necessarily a knock on Detroit - it’s no less of a ‘game’ than the likes of Until Dawn or anything Telltale has produced in recent years. But that tangible reduction in agency smacks of troubled fellow PS4-exclusive The Order: 1886. However, while Ready at Dawn’s neo-Victorian adventure was ultimately sunk by the linearity of its story, Detroit at least spreads its narrative wings with a plot that evolves and transforms with almost every decision you make. That also means that the game will move on, even if you make a catastrophic mistake. While many QTEs aren’t timed, there’s plenty that are, and should you run out of time or simply make a poor decision in the heat of the moment, it’s possible to kill off any of the three leads during the course of the story. For the most part, these deaths are permanent too, with the story simply flowing on regardless. It adds a genuine sense of danger to every scene you enter, with some moments in the game reaching Telltale’s The Walking Dead or Mass Effect 2’s suicide mission levels of stress. These stress-inducing moments aren’t particularly new to Quantic Dream’s output, but the introduction of replayable checkpoints and a storyline tracking system definitely are. The new Flow Chart might seem like sacrilege to purists, but simply being able to see just how many different paths the story has is mind-blowing in itself. Decisions you make in one chapter can have huge consequences in the next, or one 10 chapters away, with some branching paths completely greyed off if you make certain choices. Being able to see how certain paths and entire subplots lost can be lost forever makes for a great reason to replay Detroit multiple times. It’s also the kind of setup that will make this a far more attractive experience to those that may have avoided such games in the past. As you might expect for a game that’s so strongly driven by narrative, Detroit’s story is both its strongest asset and the source of its most consistent problems. The concept of artificial intelligence gaining sentience and questioning its place in the universe is hardly anything new - in fact, it’s arguably had its best interpretations in the likes of Blade Runner and Westworld - but Quantic Dream manages to bring something relatively fresh to table, mainly due to its unflinching mission to include taboo subjects rarely covered in the medium. Some are handled better than others, and it’s this inconsistency that makes Detroit such an inconsistent experience. The domestic abuse and drug addiction of Kara’s storyline - a subject that gained it and the studio a fair amount of criticism in the run-up to its release - are handled in a far more nuanced manner than previews may have led you to believe (although its a subject that also passes by too quickly to leave any tangible commentary). But it’s the handling of the build-up to android revolution too quickly descends into tired cliches and melodrama, robbing it of the dramatic pay off it truly deserves. The same duality pervades the game's dialogue. Take the quieter and more mundane moments in the story, for example, because it’s here where Cage’s script and direction really come together. 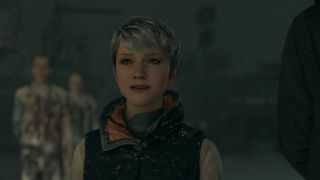 Helping Kara connect with a detached and terrified young girl never feels forced or hackneyed (although this is also thanks to Valorie Curry’s heartfelt performance), while the interplay between the Data-esque Connor and grizzled cop Hank (portrayed by the wonderfully charming Clancy Brown) makes for the best of the three storylines thanks to their genuine chemistry. It’s just a shame those nuanced moments are forced to coexist with painfully awkward scenes where the dialogue and character motivations suddenly descend into clunky cliche. For instance, in one scene you’ll guide Connor as he’s questioning another character in an LA Noire-style interrogation, only for it to devolve into a standoff where a bunch of Detroit cops are suddenly drawing pistols at one another and throwing one-liners around like a straight-to-DVD action flop. These eye-rolling moments don’t occur as often as they did in Beyond: Two Souls or Heavy Rain, but the fact they’re even present at all shows Cage and the rest of the team still have some way to go before the storytelling feels consistently matured. Talking of Connor, his sections of the story offer the most ‘game’ for your buck. All three characters can scan their environment at any time to pick out points of interest’, but only Connor can scan objects for clues. Doing so enables him to ‘reconstruct’ specific moments based on key items of evidence, much like in the Batman: Arkham series, with highlighted areas offering further clues along the way. This in combination with those aforementioned LA Noire interrogation scenes mean you’ll often find yourself hoping the story will skip back to Connor whenever it’s with Kara or Markus. The casting is mostly spot on for Detroit, with the exception of Markus. Considering the core of the story revolves around his decisions and the impact they have on the awakening of androids across the world, he ironically remains the most robotic of the three lead performances. Whether its the fault of the actor himself, the quality of his lines (which are, admittedly, the weakest of the three) or Cage’s direction, none of his divergent paths reveal anything other than an unremarkable character leading a worldwide revolution. While it carries many many of the traits of that make a Quantic Dream game so different from the rest of Sony’s first-party exclusives, Detroit: Become Human is still a bold and accomplished experience that’s leaps and bounds away from its previous efforts. At times it’s often more of a big budget visual novel than a full-on ‘game’, but, nevertheless, its themes, twists and ever-evolving character arcs will likely stay with you long after you put your DualShock 4 controller down.